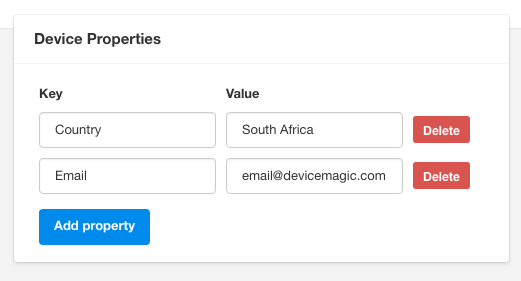 The custom attribute feature is the ability and option to add extra information about each device that is connected to your account. For example, you are able to add an email address, permanent phone number, country, or any other information that is unlikely to change and that is specific to a particular device. To attach metadata (email, phone number, etc) to your devices, you must click on the edit button on your account's "Devices" page. This will take you to the "Edit Device" page, and it is here that you can add the custom attributes, while using anything for the attribute names (e.g. "Email"). It should be noted that when you download your device list to Excel or CSV, the extra fields will show up there, too. 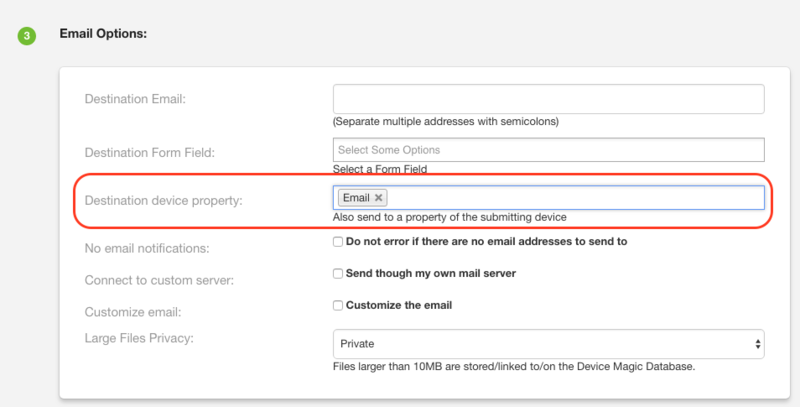 When a user submits a form from their device, it is possible to set up a destination to automatically send an email to that user. On the "Destinations" page, when you're editing or creating an Email or Word Destination, there is an option to deliver the form to an attribute you've added to a device. From the dropdown you can pick which attribute you would like to use. Your Attribute Key, named "Email", will need to be written exactly the same throughout all your devices in order to function correctly. Click the "Create Destination" or "Update Destination" button at the bottom of you Destination Settings page. The email address associated with the device will now receive an email of the submission when they submit the form. Note: You'll need to have at least one attribute associated with one of your devices to see the dropdown when you're working with the Destinations. As of yet, we have not deployed the integration of this feature into the other Destinations, but we will keep you updated on any changes.